This Irish doll features a lass with red hair and a shamrock on her dress. This Irish doll is dressed in a green dress that is enhanced with a gold shamrock and lace trim. 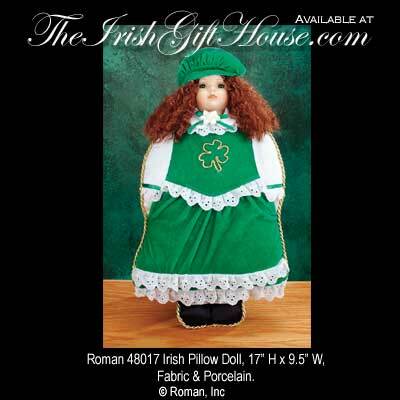 The 17" tall x 9 1/2" wide Irish doll is made of fabric and has porcelain hands and head. The doll is received with a shamrock history card that is complements of The Irish Gift House.